®. 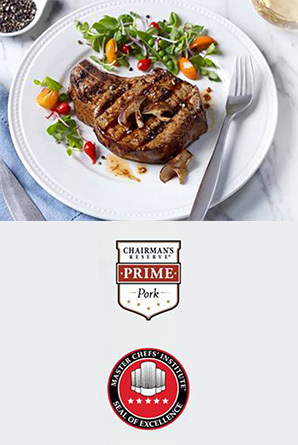 The Seal signifies that Chairman’s Reserve Prime Pork products have been evaluated by independent experts and have qualified for the Master Chefs’ Institute standard of quality. MCI works to recognize and promote excellence in foodservice and retail products. Almost 10 percent of all certified master chefs in America are affiliated with MCI and have achieved the highest level of culinary certification. The Institute evaluated all Chairman’s Reserve Prime Pork cuts against well-known competitors. All brands were evaluated individually and blindly, with identical commonly used cooking methods applied to each cut. MCI conducts rigorous testing that is unique to each product category. Criteria tested include: appearance, aroma, consistency, taste and texture, and if the product performs as claimed. The Master Chefs’ Institute dedicates itself to preserving the highest standards of culinary excellence. Its services include the coveted Master Chefs’ Seal of Excellence, product testing, consulting services, and international outreach. The Institute’s international team of Master Chefs comprise the world’s culinary elite, having achieved the highest level of certification available throughout the world. Visit www.masterchefs-llc.com.